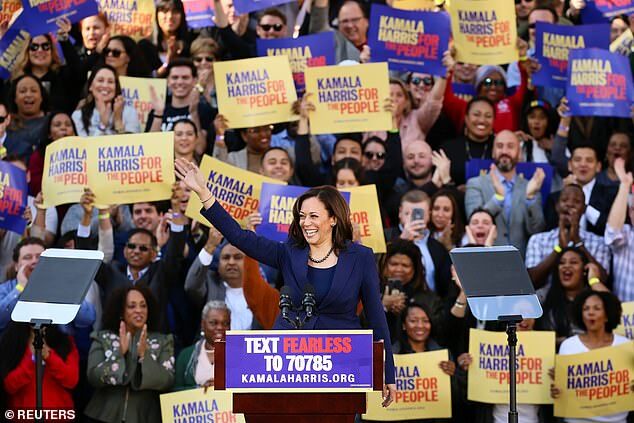 'With faith in god, with fidelity to country, and with the fighting spirit I got from my mother, I stand before you today to announce my candidacy for president of the United States,' she told a cheering crowd of 20,000 supporters. 'And as we embark on this campaign, I will tell you this, I am not perfect. Lord knows I am not perfect. But I will always speak with decency and moral clarity and treat all people with dignity and respect. I will lead with integrity, and I will speak the truth,' she added. 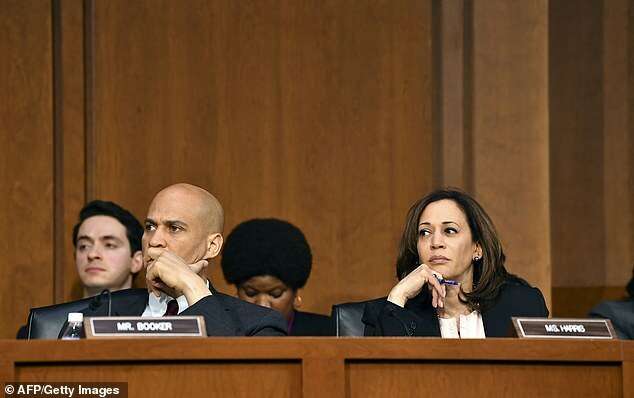 Harris, 54, entered the race with the potential advantage of being the Democratic candidate who looks most like the party's increasingly diverse base of young, female and minority voters. 'I'm running for president because I love my country. I'm running to be president of the people, by the people and for all people,' she told her hometown crowd. She spoke before a giant American flag with yellow and purple campaign signs waving in the crowd behind her. 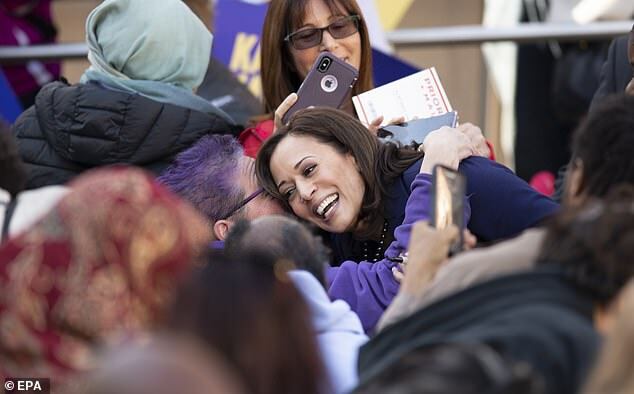 Her campaign music showed her personality: she came out to 'Work That' by Mary J. Blige and exited the stage after her speech to the mixtape version of 'My Shot' from the musical 'Hamilton. Her address was filled with soaring rhetoric and repeated the line 'let's speak the truth' as one of the passion points of her campaign. 'Under this administration, America's position in the world has never been weaker. When democratic values are under attack around the globe, when authoritarianism is on the March, when nuclear proliferation is on the rise, when we have foreign powers infecting the White House like malware, let's speak that truth. And let's speak truth about what are clear and present dangers. And let's speak the biggest truth, the biggest truth of all. In the face of powerful forces trying to sow hate and division among us, the truth is that as Americans, we have so much more in common that what separates us,' she said. 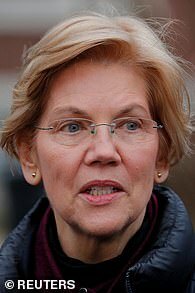 She slammed Trump's idea of a border wall as 'a medieval vanity project' and criticized the administration for its immigration policy. 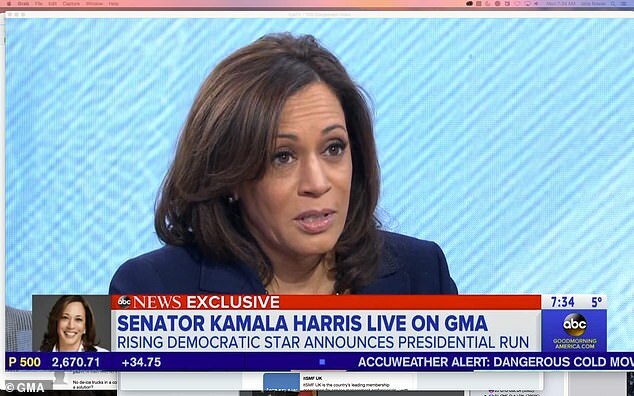 She did not mention Trump by name but her criticism of his administration was obvious in her words. 'I am running to declare, once and for all, that health care is a fundamental right, and to deliver that right with 'Medicare for All.' To declare education is a fundamental right, and we will guarantee that right with universal pre-k and debt-free college,' she said. She also called for criminal justice reform, a reduction in the gender pay gap and a middle-class tax cut. 'I am running to guarantee working and middle-class families an overdue pay increase. We will deliver the largest working and middle-class tax cut in a generation,' she vowed. 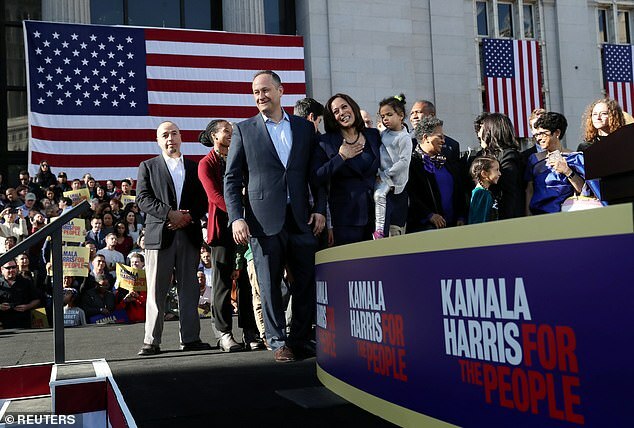 'It's fitting that Harris chose the most liberal district in deep-blue California to launch her campaign. 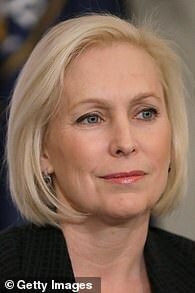 Government-run health care, weaker borders and higher taxes might be popular there, but her liberal policies are totally out-of-step with most Americans. President Trump has led this country to record economic highs and strengthened our national security, and it's why he's going to be re-elected in 2020,' said Republican National Committee spokesman Michael Ahrens in a statement. 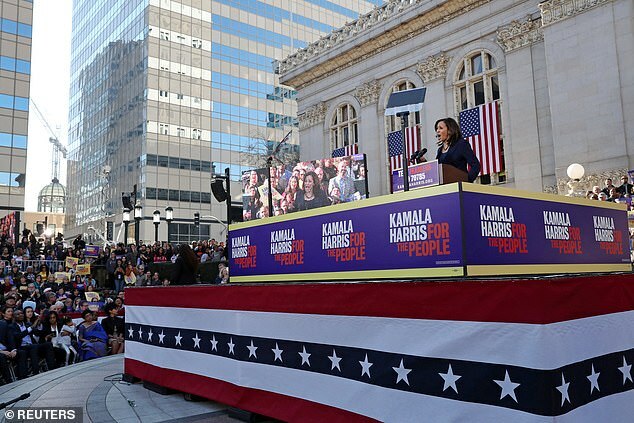 Harris announced her intention to run last Monday and slipped in a few campaign appearances before Sunday's formal launch. She heads to Iowa for a town hall in Des Moines this Monday evening. 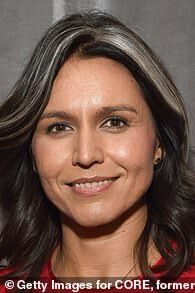 By launching her bid in the town where she was born, she used her speech to highlight her biography and her work for the community - a tactic similar to one Barack Obama used when the then-first term senator announced his candidacy. 'It was just a couple of blocks from this very spot nearly 30 years ago as a young district attorney, I walked into the courtroom for the first time and said the five words that would guide my life's work. 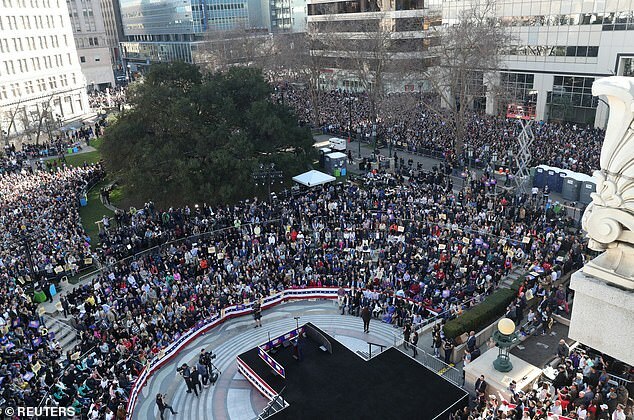 Kamala Harris for the people,' she said. 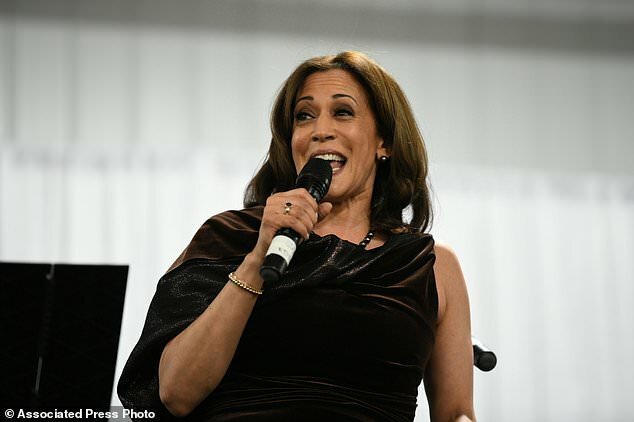 Harris appeared at a fundraiser for Alpha Kappa Alpha Sorority Inc., of which she is a member, Friday, Jan. 25, 2019 in Columbia, S.C.
'My whole life, I've only had one client: The people,' Harris said, echoing the words she has used in courtrooms and has adopted as her campaign's slogan. 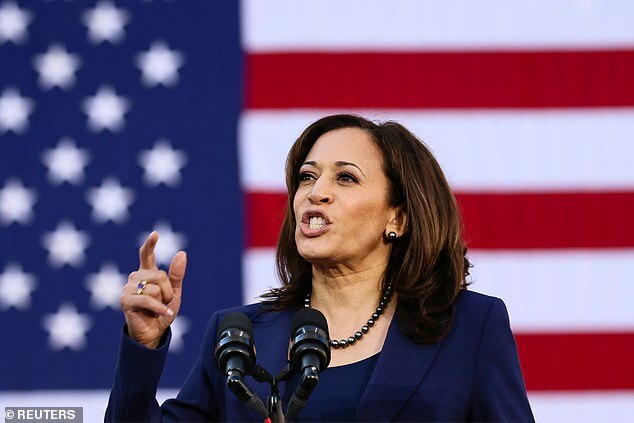 Harris is among the first major Democrats to jump into what is expected to be a crowded 2020 presidential contest and she is one of several women competing.